The Abortion Rights Campaign has grown exponentially in the relatively short time since its foundation. This is reflected in the huge number of volunteers who campaign with us across multiple working groups – both throughout the country and further afield. It’s reflected too in the massive increase in attendees at the annual March for Choice year after year – with this year’s March attracting a record breaking 40,000. Our activists, from admin to media, from policy to outreach teams, are a dedicated and diverse range of people whose common ground is a passion for securing free, safe, and legal abortion access in Ireland to anyone who requires it. Our diversity as an organisation includes political diversity – we have volunteers from a variety of political backgrounds (and none!). We have always been a non-affiliated campaign group and this has worked very successfully. It has enabled us to operate without partisanship and to therefore remain focused on working towards our shared goals as an organisation. While we absolutely encourage and welcome support from any political party, and have worked closely on specific actions with several of them, it’s important to remember that we have no organisational bias towards any group. Quite simply – we will work with anyone who supports our cause and shares our values. Outreach is a vital part of our work and that includes regular engagement with parties and politicians across the country. In the months ahead we will be working to encourage TDs from all parts of the country and across all parties to support our position on abortion. Recent polling indicates very clearly that Ireland is an increasingly pro-choice country. It indicates too that voters understand that broad based access to abortion is necessary, because the circumstances in which a pregnant person may wish to seek an abortion are many. Supporting access to free, safe and legal abortion is rational, compassionate and increasingly in line with public opinion. In an increasingly progressive Ireland, our message to the country’s political parties is clear – make sure you’re on the right side of history. By implementing pro-choice policies you are taking a step towards bringing our laws up to scratch with International standards. By implementing pro-choice policies you are telling the women and pregnant people in your party that you respect their right to make their own decisions with their own bodies. By implementing pro-choice policies you are telling the voters of Ireland that you acknowledge their demands and respect the will of the majority. We are always willing to work constructively alongside any party that shares our values. 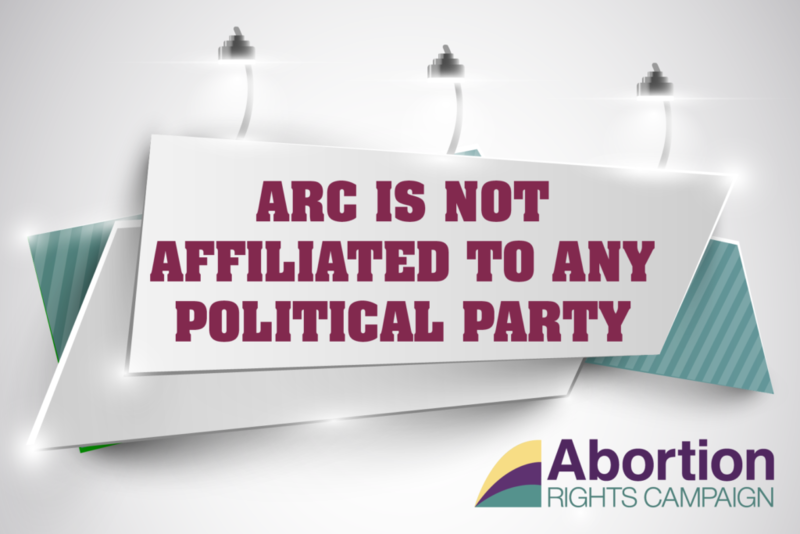 It is imperative, however, that the the Abortion Rights Campaign remains non-affiliated as long as it exists. As the referendum approaches, it is doubly important to clarify this. Our goal, after all, is not a political one. While abortion is an issue that has been politicised we do not believe there is anything inherently political about our goal: to ensure free, safe, and legal abortion care is accessible to anyone in Ireland who requires it, without exception. We will accept the support of those who are willing to join us in accomplishing that goal.